The Northwest Instrument Siteline NSL100B is an accurate and easy-to-use level designed for different leveling applications. 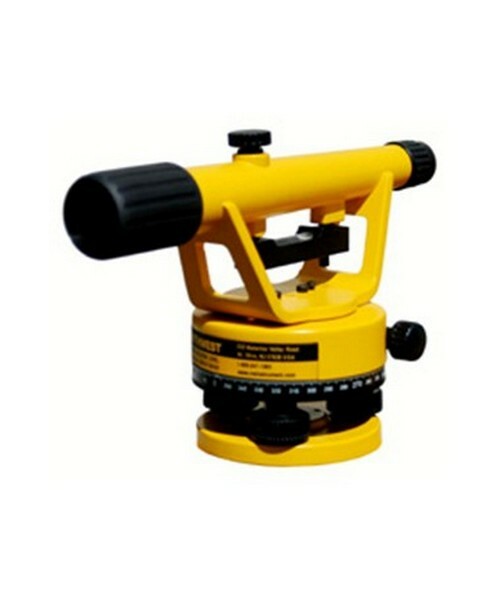 Featuring 360-degree horizontal circle with vernier scale, this optical instrument performs precise measurement of horizontal angles and can handle various tasks, such as level foundations, patios or decks, run straight lines or turn angles. With a working range of up 200 feet, the NSL100B provides 20x magnification and accurate sighting up to 1/4-inch at 100 ft. The eyepiece is also equipped with fixed cross hairs for precise measuring and viewing. It also features rubber lens jacket that protects the lens and provides sun shade to reduce glare. The Siteline NSL100B offers manual leveling using three leveling screws and leveling vial. It also has a multi-layer coated lens that provides clear rod readings. With a 5/8 x 11 thread, this optical level’s base fits both flat head and dome head tripods. Designed to withstand the rigor of everyday field use, NSL100B boasts an IP-54 rating for protection against dust and water protection. This Northwest Instrument level package comes with a plumb bob, hard carrying case and 1-year manufacturer’s warranty.